Everything we know about the appearance and behaviour of the most populous dinosaur of North America could be turned on its head following a discovery in Alberta, Canada, by Dr Phil Bell from the University of New England in Australia. 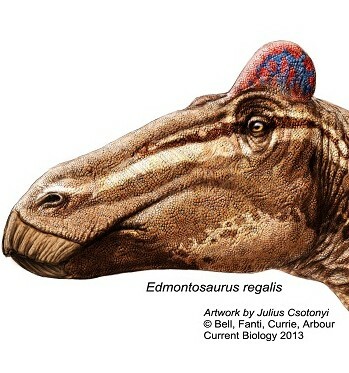 A rare, mummified specimen of the duck-billed dinosaur Edmontosaurus, found in deposits west of the city of Grande Prairie in Alberta, shows that these dinosaurs’ heads were adorned with a fleshy comb, similar to that of a rooster. The specimen is currently housed at the University of Alberta and has been described by Dr Bell in the renowned international journal Current Biology, released on December 12. This is the first time that a ‘soft tissue display structure’ has been identified on a dinosaur and could mean that many of the popular images we have of dinosaurs – from movies to the plastic toy variety – could require a makeover. The duck-billed dinosaur or Hadrosaur was the most common dinosaur in North America between 75 and 65 million years ago. They were gentle herbivorous giants – about 12 metres long – and filled a similar ecological role to Australian kangaroos or Canadian deer today. Dr Bell says no one ever suspected dinosaurs may have combs like roosters, because the evidence of soft tissue usually decays before fossilisation. Working in the field excavating a site in near Grand Prairie, Dr Bell recalls the moment he made the discovery at the point of his chisel. Dr Bell says the significance of this discovery may not be limited to this one species of dinosaur. “We could imagine a pair of Edmontosaurus sizing each other up, bellowing, and showing off their head gear to see who would come out as the dominant male and who would take charge of the herd,” Dr Bell says.